Photo by Liz Martiniak © Liz Martiniak 2003; all rights reserved. The skeleton of the 19th Century champion and leading sire HANOVER (1884, by Hindoo, out of Bourbon Belle by Bonnie Scotland) is in storage in the Draft Horse Barn at the KENTUCKY HORSE PARK, a Kentucky State Park on Iron Works Pike north of Lexington, Kentucky. He was initially buried at McGrathiana Stud where he died in 1899, and his skeleton was exhumed and given to the University of Kentucky, where it was kept for many years. 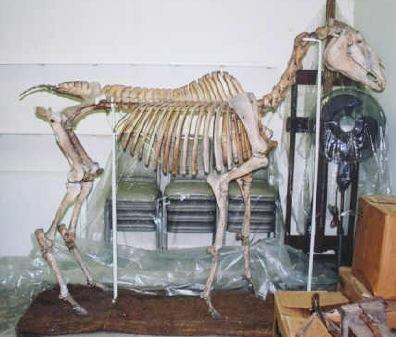 In the late 1990s, the articulated skeleton was moved to the Kentucky Horse Park. Also located on the Kentucky Horse Park near the Big Barn, is the WALNUT HALL STUD, cemetery, where many top standardbreds are interred.